The holiday season’s just around the corner and to kick things off Mockplus has announced there will be a big sale starting tomorrow until the end of this month. The holiday season’s just around the corner and to kick things off Mockplus has announced a big sale starting now and runs until the end of this month (November 30, 2017). 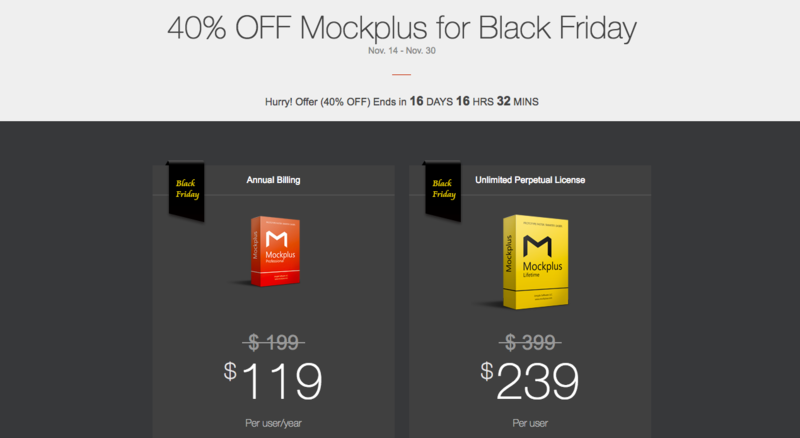 To start the deal off, Mockplus now offers up to 40% off discount for any interested users, no coupon required. Note that, this special offer is applicable for both of the Annual Billing and Unlimited Perpetual License plans. Claim the exclusive 40% OFF discount now! 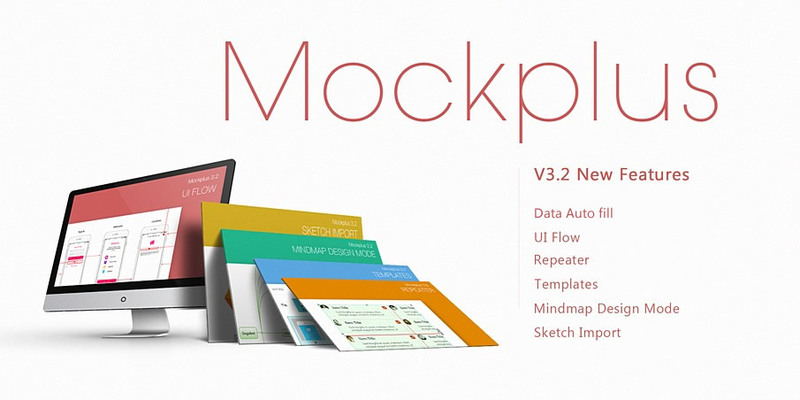 Mockplus is an all-inclusive tool for prototyping mobile, web and desktop apps easily and quickly. With a rare combination of functionality, simplicity and inexpensiveness, it has become the new darling for designers and the best solution for those who want to focus on their design, rather than the tool itself. Also want free UI Kit Package and E-books? Join Mockplus Slack Group to get them! It's also a great place to get free and timely assistance from support guys of Mockplus team. Annual Billing - $119 only, saving 80 bucks at least. Unlimited Perpetual License - $239 only, saving 160 bucks at least. A real cool thing is that users will get their orders renewed also at the discounted price, rather than the original price. The price can be pretty competitive in the industry of prototyping tools, and it’s the ideal choice for people with limited budget while tight deadline. In addition to cost-effectiveness, it has a bunch of brand-new features in store for your better design. 1. Repeater, convert any components into a repeater easily, simple click and drag to adjust the border. 2. Auto Data Fill, single or batch fill of images/texts, saving much time and efforts creating repetitive elements. 3. UI Flow, take an overview of page content and the connections of each page, with important page markups included. 4. Mind Map Design Mode, lay out the project pages beforehand and better showcase the included features in an intuitive way. 5. Sketch Import, turn your pixel-perfect design into interactive prototypes with ease, and then get it published as a team project. 6. Page Templates, all kinds of well-built page templates available for your reference, including social, shopping, news, tourism, music, etc. How to Get the Special Offers? It’s pretty easy to redeem the discount. As mentioned, anyone who goes to the Buy page will be able to get the speical discount. This means, any of you will get an exclusive 40% off discount without any coupon code or promotion link. Only few clicks will get you the real big bargain. Catchy, huh? Hurry up to get the best deal before it ends! To reward their loyal users and followers on social channels, Mockplus also promises to give you free access to all of Pro features, with no credit card or tied contract. Everyone has a chance to get 365 or 15-day free access to all premium features! Find more details on Facebook, Twitter and Instagram. Here, we’ve rounded up a list of the best Black Friday & Cyber Monday deals for your check. Hope you can find the needed one. Enjoy! As an excellent team collaboration platform, Futuramo can empower your team to work better and faster with the Futuramo collaboration apps for project and task management. 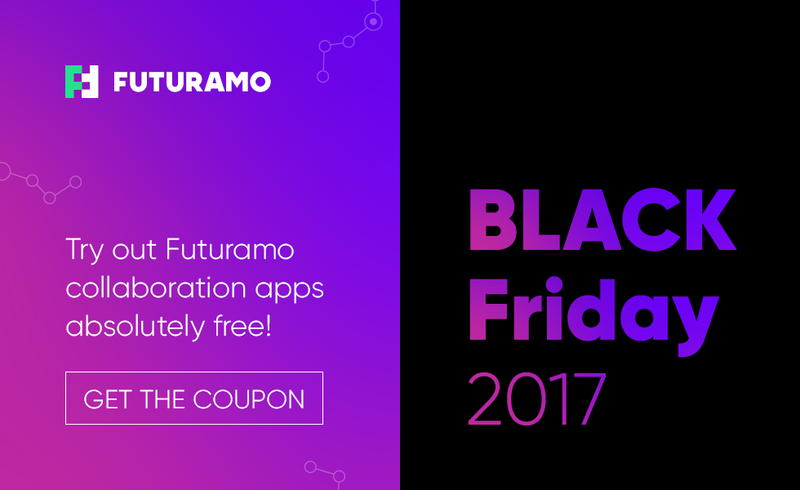 They are giving an unlimited number of licenses for the Futuramo apps: Visual Tickets, Time Tracker and Tasks. It means that your entire team, regardless of the size, will be able to use the collaboration apps absolutely free for 1 year. Deal: $99 (instead of $199) for one year. Pay half price now to get everything unlocked for one year, including all icons, formats, and apps. If you can't find an icon you need, the Icons8 team will create it for free for you. This is valid until November 27th 2017, and you are promised a 30-day money-back guarantee. Another cool thing is there is a recurring charge of $99/year. Cancel anytime with one click. But if you cancel, though, you'll lose your 50% discount for the next year. 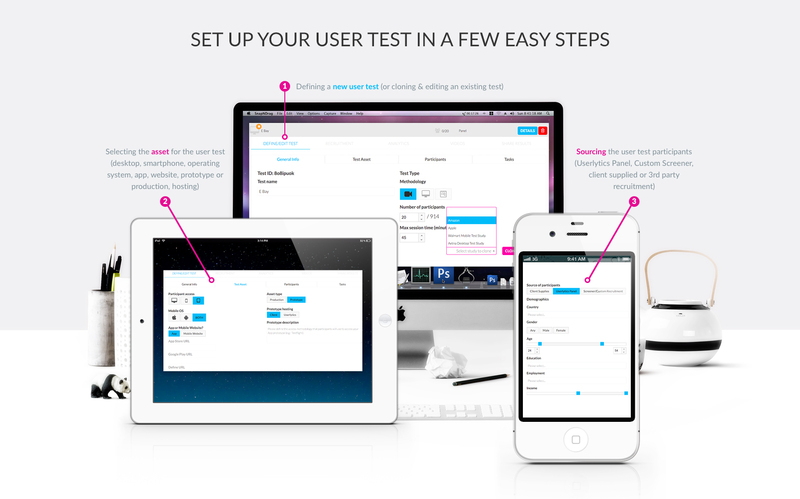 Use the most advanced user testing platform on the market, with picture-in-picture recordings, branching logic, time on task, success/failure metrics, system usability scale (SUS), Net Promoter Score (NPS and other qualitative and quantitative usability testing metrics. Mention MOCKPLUS2017 when you contact Userlytics and you will receive an offer for a 50% discount on any user experience test you launch during November 2017. 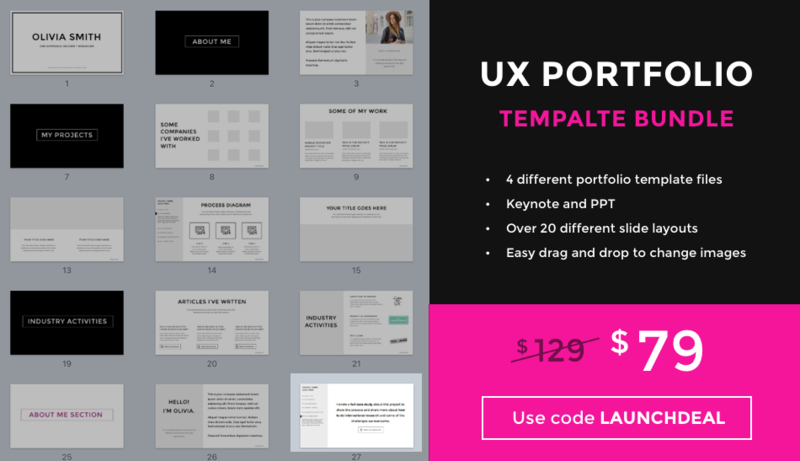 The UX Portfolio Template Bundle includes 4 different UX Portfolio Templates (each file is for Keynote and PPT). These professionals designed templates help you cut the time to create your portfolio in half. Choose from over 25 different layouts to showcase your work. And, each template is customizable depending on how much text you want to have — they’ve designed each template in 3 flavours, a lot of text, a lot of images, or a mix of both. So even if you aren’t awesome at visual design, Keynote, or PPT you can still showcase your UX work in an awesome portfolio so that you can stand out. 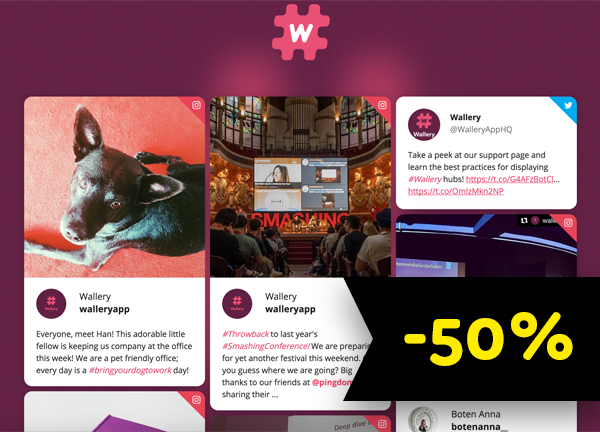 Display Twitter and IG posts with any hashtag in real-time! Design a social media wall that will follow your established design principles and style.